When fewer people in your city or town have bed bugs, the odds of you or me bringing them home with us is lower. Providing factual information about bed bugs to people suffering seems to be the single most effective tool for reducing infestations city, country, and world-wide. This site began in 2009 as a response to my own infestation and the lack (at the time) of a singular resource detailing effective and proven tools and techniques to get rid of bed bugs. Having begun this saga not knowing bed bugs were real (thus the bus banner on that bus “Bed Bugs Are Real”), like most visitors to this site I was behind the learning curve and the bed bug reproductive cycle. Having bed bugs was possibly one of the worst experiences in my life, but it is my nature to want to make lemonade out of lemons, or in this case, bed bugs. 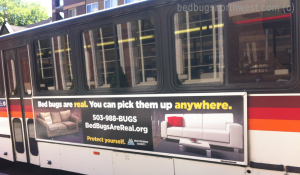 Public education and advertising about bed bugs. Creating a comprehensive bed bug information section of the Multnomah County Health Department web site. Many subsidized housing agencies improved their response and protocols for treating bed bugs for their tenants. Passing legislation at the state level to encourage pest control companies to provide geographic data about bed bug treatments administered. Allocated funding for Aging and Disabilities service to provide bed bug preparation services to help people avoid eviction because they are unable to comply. All of those goals were achieved and awareness was raised about bed bugs. More effective tools and protocols were and are being used to help residents who don’t have the resources to treat and end their own infestations. However, bed bugs are still with us and there is a lot of work to be done to help control and contain them when they move in. Yes, this site uses ads to pay for the site costs and endless hours keeping up on those wacky bed bug antics so you and I can truly sleep tight without fear. I did use almost every product mentioned on this site and candidly mention when I didn’t. Those products helped me win my bed bug battle and it still wasn’t easy or fast, but it’s six years later and I’ve been bed bug free since 2009. You can read more about the steps I took to get rid of bed bugs in my home here.